It has certainly been a while since I provided any type of update on this blog, and for that I apologize. 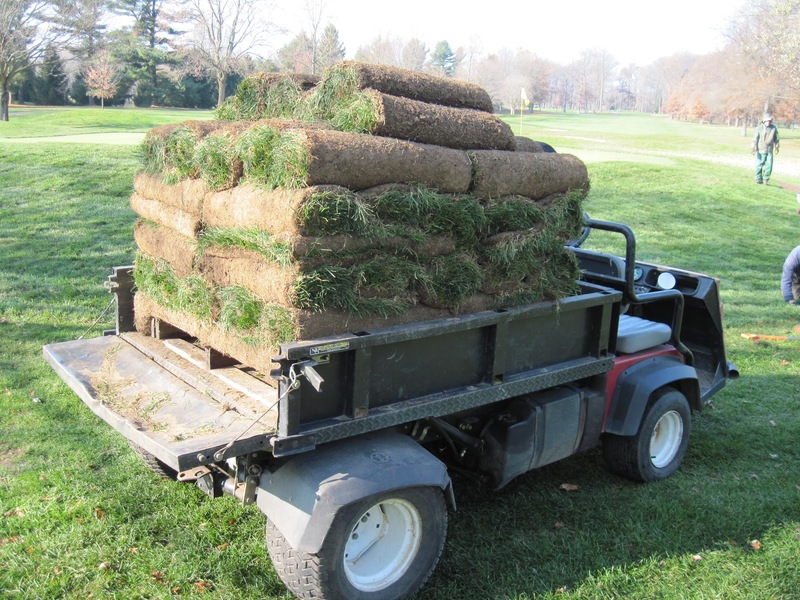 The Grounds Department has been exceptionally busy this Fall working on several projects. 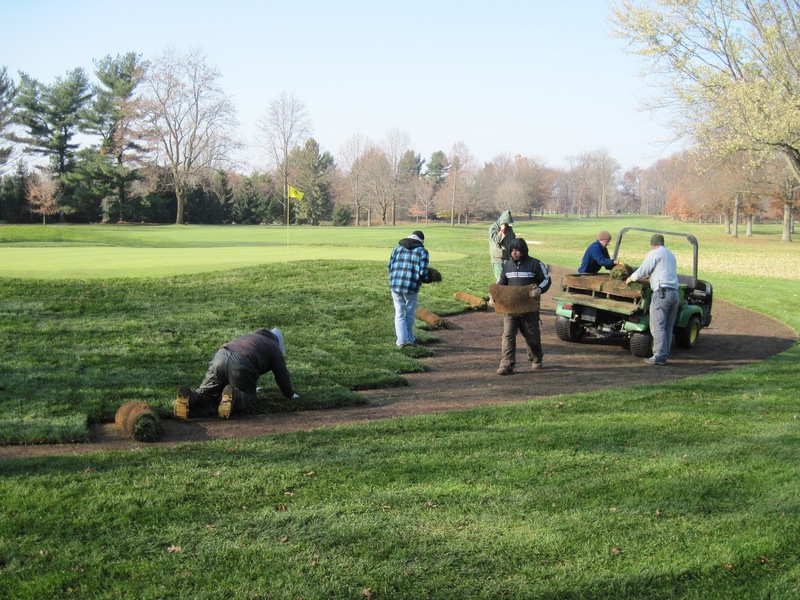 Most notably the sod work around the greens that has been an ongoing project since early Fall. All of the green surrounds, or at least a 7-8 ft. pass around each green has been stripped and had new sod laid in an attempt to improve playing conditions during the summer months when certain types of turfgrass are stressed beyond what they can handle. For more detailed information and a video explaining our circumstances, please click here to revisit a previous update from this blog. Finished sod work around a green. A MAJOR improvement! If you recall, three greens on the golf course (#2, 7 and 15) had “mowouts”, or areas of lower mown turf, around them to make the playing conditions more favorable. 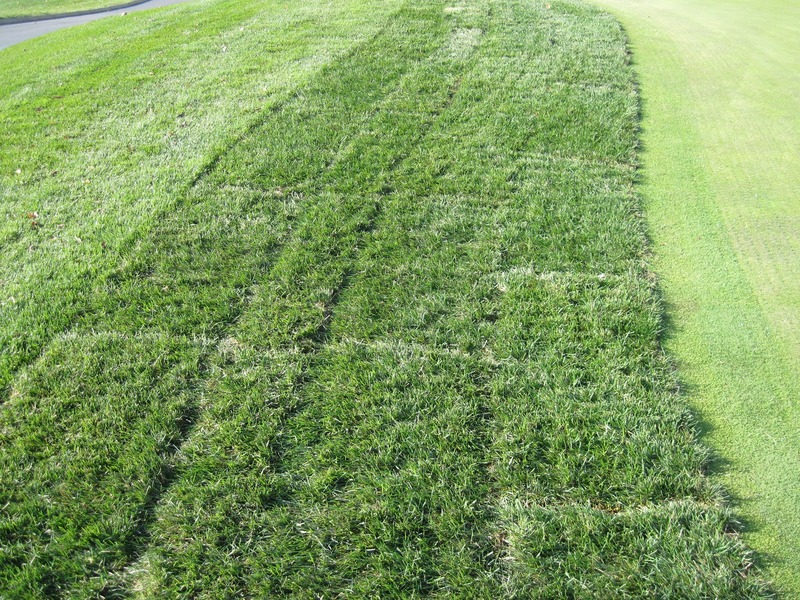 These mowouts were established in areas where there was an extremely high population of bentgrass. By mowing these areas lower, the ball had a better lie and shots from around the green were more manageable. These areas have since been stripped of the bentgrass and received new sod. Going forward, this sod will be maintained at rough height, thereby eliminating the mowouts. with clean sod and will be maintained at rough height. The 7-8 ft. pass around each green will be staged down in the spring to match up with our Intermediate cut that we have always maintained around the greens. I am sure you will notice a significant difference, not just visually, but in the conditioning as well. Please contact me if you have any questions and I promise that the updates will be a little more regular in the future. There will be lots of updates to post as we have some minor projects with some of the tees, tree work and our usual winter maintenance around the shop and golf course. Have a great remainder of your Fall!